Do you know how healthy the River Thames really is? It’s hard to see what’s going on underneath the surface of our capital’s river. The water is dark and muddy, which makes people think it’s dirtier than it is. But the water in the River Thames has always been dark – its name may even have come from the Celtic word for dark: ‘Tame’. This is because of the London clay it flows over and the fact that, as it approaches the sea, the amount of silt increases. Technology has enabled us to see into the darkness, thanks to water quality probes, but until now this data hasn’t been widely accessed and most Londoners have no idea how healthy the Thames is at any given time. For the first time, Londoners and visitors alike will get a daily, highly visible update on the river’s health through an animated lighting display on the front of the iconic Sea Containers building on the South Bank. Accompanied by a daily Twitter feed @ThamesPulse, the initiative, supported by media agency Wavemaker Global (formerly MEC Global) based at Sea Containers near Blackfriars Bridge, for waterways charity Thames21, aims to raise awareness about the health of the River Thames. The River Thames has come a long way since the 1950s, when it was declared biologically dead. There are now 125 species of fish in the Thames and seals can be regularly spotted. But it still faces two main problems: litter, especially plastic litter; and regular outflows of sewage. Sewage enters the Thames on average once a week, which reduces oxygen levels in the river, essential for life. Thames Pulse can’t monitor for plastic, but it will update the public on the water quality of the Thames in Central London. Is water quality improving, static or declining? Each evening, the lighting on the river frontage of Sea Containers will change to display a pattern that reflects the river water quality in Central London, creating a visualisation of the data taken directly from the Thames. The artwork will display one of three patterns based on whether the water quality is improving, static or declining compared to the previous week’s data reading. Improving: pink and blue lights pulsate furiously up and down the frontage. See the lights in action in this demonstration video. Can the water support Thames fish? The water quality will be measured at a consistent time and place every day, monitoring for dissolved oxygen, pH and nutrient levels. Thames fish such as flounder and eel need plenty of oxygen in order to breathe. If the oxygen levels fall dangerously or there is a dramatic increase in ammonia or pH (which can also be caused by sewage outflows) then these types of wildlife will find it harder to survive. The lights will change according to daily water quality data sent from Environment Agency probes and, at a later date, be combined with a manual water quality test of the Thames’ water in front of Sea Containers. People across London are already monitoring and protecting the health of the Thames through our Thames River Watch programme, and we’d love you to join us! Our latest litter monitoring results made headlines across the UK and beyond. Thames21 runs fun events on the Thames and other river catchments throughout London. Visit our events calendar page for more information and find out how to get involved. 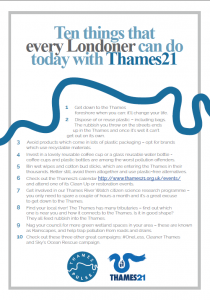 Did you know that by using a reusable cup or coffee mug you’re protecting the health of the Thames? Sign up for our Manifesto on how you can help look after the Thames without stepping foot on the foreshore! The project has won two award, one in the Campaign Tech Awards and another in the Newsworks Advertising awards for Best use of Insight.